Broad Lane Vets has decided to help PBBUK in its vital work, by holding a blood drive on its premises. If you would be interested in your pet taking part, we would be really pleased to hear from you. COULD YOUR PET BE A HAIRY HERO? Most people are well aware of the important work of the "National Blood Service" run by the NHS for humans. But have you ever considered what would happen if your pet required a blood transfusion? These may be needed following a road traffic accident, during surgical procedures and in many diseases, and are as important in pets as they are in people. In the past, many veterinary practices have simply not been able to offer blood transfusions as a treatment option. However here at Broad Lane, we have long recognised the life-saving benefits of transfusions. Until now, we have relied on blood donated mainly by pets belonging to our staff. "Pet Blood Bank UK" is a pioneering new charity, and is the first formal pet blood bank in the UK. PBBUK collects blood from volunteer pets, and this is where you can help. These volunteers are mainly much-loved family pets, and what they all have in common is that their owners understand that by making a blood donation, their pet can make a real difference in saving the life of another pet.Broad Lane Vets holds regular blood drives at its main site to collect blood for PBBuk. We are always looking for new blood donors, and would love to hear from you if you are interested in your pet taking part. For more information click here. Your dog will need to be of general good temperament, fit and well, over 25kg and meet various other criteria. 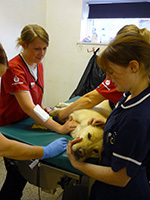 The welfare of pet blood donors is looked after throughout the donation process. 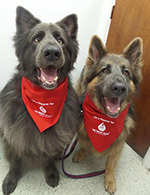 They will receive a free health assessment, including full blood screen and blood-typing, as well as a goody-bag and treats after each donation to thank them for being a doggy lifesaver. Could your pet be a hairy hero?! If so, download an application form here.